Is this issue originating in JES? Is it a JES bug? Does anyone know the significance of this? What is GAIA? 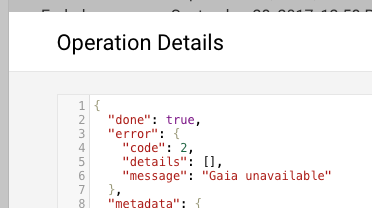 I unfortunately don't have an answer for you as I have never seen a Gaia error either. I will speak with the development team and see if they have an answer for you. Soon after seeing the message, I restarted the workflow and I did not see the GAIA error message in the re-submission. Good to hear it was transient at least. If you have any more problems with it, let me know.